Beatons Blog : #Crowthorne: Open House to Support Alexander Devine! #Crowthorne: Open House to Support Alexander Devine! Saturday 30th January marks our famous Charity Open House Launch event ~ this time for Beatons Crowthorne ~ and in aid of Alexander Devine Children's Hospice Service, and our 'communitea cause' for 2016. From 10 am to 12 noon. We'll be notching up three firsts for Crowthorne: debut performances of a song and a poem celebrating the village's unusual history and Crowthorne getting its own bookshop (well, to be precise it's a combined tearooms and bookshop). Come along to the official opening at 10 am by the Mayor of the Borough of Bracknell Forest, Councillor Mrs Dee Hamilton after which the song and poem will get their first public airing and let's raise lots of money for Alexander Devine! The specially-written poem will be performed afterwards by author Liz Darcy Jones. 'Sing a Song of Crowthorne' by a group of children from The Dani Harmer Academy of Performing Arts. Can we give them a huge thanks in advance for pulling a rabbit (or should that be a crow?!) out of the box to learn and perform at very short notice. Crowthorne seems to have no end of music, dance and drama lovers! Free samples of Beatons' signature carrot cake and Nonsuch BV loose leaf tea will be served until noon (we hope in return for your donation to the charity). Please note! Our normal service may be briefly suspended during the Open House event. on our Crow Thorn Tree?! What do we want you do to? 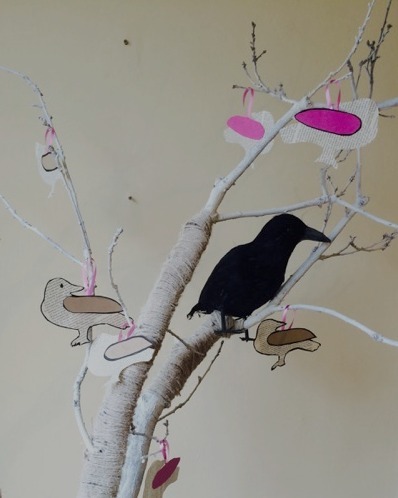 Help create a unique 'crow thorn tree' artwork by signing your name and hanging a cut-out crow on the tree made by franchisee Paul Mitchell's creative young family when you donate. It's an amazing and beautiful object d'art that your 'crow' will be part of! The Beatons Crowthorne poem and adaptation of Sing A Song of Sixpence - re-titled 'Sing a Song of Crowthorne' - are by our Press Officer who just happens to be best-selling Tea Poet Liz Darcy Jones. She's been associated with the group for the past four years. Both pieces praise Crowthorne's unique characteristics including mentions of Wellington College, Broadmoor, and the now extinct 'broomdashers'!